This morning, I was on our local CBS affiliate here in San Diego talking about some fun and free things to do in North County. If you're not from here, you don't know that North County is like its own separate little thing. Although we've got a lot going on, including the San Diego Fair, we usually get the short end of the stick when it comes to lifestyle reporting. Most of the event information that's shared on the local stations is for things to do closer to downtown San Diego, so when the morning producer asked if I wanted to do a segment sharing some fun and free things to do up here, I jumped at the chance. Hike a Volacano... in Carlsbad! One perennially popular post that I didn't mention on the segment is 25 Fun & Free Things to Do In North County, which I painstakingly updated for 2017. I do it for YOU, my friends! I do it for you... Anyway, lots of cool things on that list, as well. And like the title says, they're FREE. If you live in the area or are visiting, I hope you put those things to do on your list! In the coming weeks, I'll be sharing some local places to stay and visit in my adopted home of Carlsbad. As you may know, it's also the home of LEGOLAND California and miles of pristine beaches. Not to mention, some super tasty places to eat and drink. Today, I'm sharing all about a new Hilton property: Cape Rey Carlsbad. A Cape Rey summer vacation offers endless options for family fun. The Junior Beach Ranger program is a summertime favorite. Families meet up at the Campfire Center at Carlsbad State Beach campground directly across from the hotel every Tuesday and Friday from March to October. The 45-minute ranger-led program teaches visitors about marine life, ecology and the environment in fun interactive sessions that include nature walks, tide pooling and hands-on activities. Each participant also receives a special ranger logbook with stickers to track their accomplishments and take home as a keepsake. Active families can rent classic beach cruisers from the resort's concierge and enjoy scenic rides along easy coastal bike routes. Another fun option is kayaking, paddle boarding or sea-biking at the nearby Aqua Hedionda Lagoon where calm coastal waters create the perfect environment for beginners and young ones. Families can also plan a stop at the Lagoon's discovery center to check out fun exhibits and displays, which teach about the area and unique lagoon environment. To make a day of it, Cape Rey offers Beachside Picnics To Go, which are packed in individual cooler bags so guests can stop along the way and fuel up. The picnics include a selection of delicious adult- and kid-friendly sandwiches, sides, house made cookies and drinks. Of course family fun is never more than steps away from the guest rooms. Kids and parents can frolic in the resort's ocean view pool that includes a zero-entry, kid-friendly design. Summer also means the return of Cape Rey's family activity center that features a variety of fun games and activities for all ages, plus craft programs to keep youngsters busy while mom and dad relax by the pool or enjoy an ocean view cocktail.Just 150 steps away is the beach, which is all the more enjoyable with the addition of Cape Rey's beach pack that includes chairs, an umbrella and beach towels. Right now, the SoCal ocean front property is enticing families with two great getaway packages and fun new programming that allows guests to immerse themselves in local exploration by land, by sea and even by lounge chair. With a location just minutes from Carlsbad's LEGOLAND CALIFORNIA theme park, Cape Rey's new Legoland Resort Hopper Package sets the stage for the perfect Lego vacation. This package includes two-day resort hopper tickets for two adults and two children good for admission at LEGOLAND, SEA LIFE Aquarium and the LEGOLAND Water Park. Prices start at $575 per night and include complimentary resort shuttle transportation to and from the park. Second day admission tickets can be used at any time, so families can take a beach-day break before heading back to the park. For families who prefer to do it all- beach, theme parks, museums and more- Cape Rey's new Family Beach Package is a good choice. This package includes overnight accommodations, breakfast for four (two adults and two kids), plus 15% off dining, spa, and tickets to local theme parks and attractions. Prices start at $224 per night. For the most part, I haven't been making the conference rounds over the last few years. I took a super quick road trip up to San Francisco for BlogHerPro in December and it was great to connect with people I hadn't seen in such a long time. It reminded me that conferences are about more than the latest digital trends and glad-handing brands. I attended Mom 2.0 a couple of years ago when it was here in Southern California and it quickly became my favorite. The size, the workshops, the parties... all good stuff. So when the opportunity to buy someone's Mom 2.0 ticket in Scottsdale came up, I grabbed it. Scottsdale is one of my favorite road trip getaways. It boasts the famous "dry heat" that I love and the rugged landscape is an awesome and beautiful backdrop for the resorts that dot the landscape. The drive out from San Diego is about six hours, which isn't really too long. It's a quiet drive and the bonus is the incredible desert scenery you get to drive through. My plan was to rent a car as Mr. Jones will need the Land Cruiser to tote the kids around while I'm gone. But at the last minute, I saw another blogger and app creator post that she would be driving out from San Diego, so I messaged her to see if she would accept my offer of snacks and gas money for a ride out and back. She and her business partner agreed to let me be a third, so yay! There's a LOT of chatter about what to wear. I'm not so worried about that as I just received two Stitch Fix boxes in the last couple of months. Plus, I plan on spending some quality time at the pool. But I can't float the WHOLE time, so I need to make sure to pack the essentials: a little black dress, a pair of white jeans and a pair of dark denim jeans, some tops, yoga and running clothes, comfy shoes for walking the grounds, and wedges for the rest of the time. Plus a few items that I'm not even going to think about leaving home without. I recently switched up my daily makeup routine and have been using ColoreScience products. (Write up coming soon.) One of the products stays neatly tucked in whatever bag I'm carrying for easy re-application. It's a mineral powder that is completely water resistant. I know this to be true because I tested it with my own hands. I'm not a big fan of powders, but this one is so light and has the added feature of being a broad-spectrum sunscreen. I love my pool time, but I don't head out into the sun without serious skin protection. The left side of this scarf was sprayed with Downy Wrinkle Releaser Plus. I think I gave it maybe four to six sprays and then tugged a little at it, as per the instructions on the bottle. In less than a minute, the wrinkles were gone. I hate ironing when I travel, but especially when I'm at a resort in Spa Town. Nothing ruins the mood like a hot iron. The Wrinkle Releaser is also great for removing static and has a nice clean scent that is perfect for freshening up clothes that have been packed away in a suitcase or in the back of your closet waiting for another road trip. And bonus! It comes in a convenient 3oz. travel size, perfect for popping into the carry-on. What's worse than no Wi-Fi? Running out of juice. And it ALWAYS seems to happen when you need it most, doesn't it? Most conferences have a charging station somewhere, as Mom 2.0 has set up, but it's not always convenient to get away from the keynotes and breakout sessions. A portable charger is a must for a blogging conference goer. but if you're like me, you've got more than one device going at a time, so not just any charger will do. That's why I carry the RazorMax from myCharge.com. It keeps multiple devices charged at the same time and packs 27 hours of recharge life. If you don't need both ports, you can make a new best friend at the conference and share with someone else that's running out of juice. I'll be tweeting nuggets of wisdom from Scottsdale, as will all the other attendees. Make sure to follow along with me on Twitter! Are you going to be at Mom 2.0? Find me and say hi! If I'm not in one of the sessions, I'll be floating in the pool! Yuma is a city I've driven through many times. I've never actually driven TO it... until last November. Yuma is the place that marks our exit from or return to California. It's the beginning of an adventure on the way out, or the home stretch on the way back. What took me to that quaint little town on the Colorado River? I went for the Annual Medjool Date Festival and inaugural Date Night, of course! Medjool Dates, if you are unfamiliar, are fruits that grow in palm trees; more specifically, Date Palms. They are very popular throughout the Mediterranean, Middle East, and Egypt. They've been around so long, they're even mentioned in the Bible! Commonly referred to as "Nature's Candy," the Medjool Date is a sweeter, larger, plumper cousin to the date used for baking and found in fruit cake, the Deglet Date. If you've ever had one of the baking dates, you might think the Medjool Date tastes about the same. Dates have a high mineral content, which is beneficial for many different health conditions, but their impressive levels of iron make them a perfect dietary supplement for people suffering from anemia. One of the most interesting facets of dates is the presence of organic sulfur in them. This is not a very common element to find in foods, but it does have a worthwhile amount of health benefits, including the reduction of allergic reactions and seasonal allergies. Dates are high in natural sugars like glucose, fructose, and sucrose. Therefore, they are the perfect snack for an immediate burst of energy. Even so, these sweet, bite-sized, wrinkly fruits are classified with a low glycemic index, according to a study published in the Nutrition Journal. Dates have high levels of soluble fiber, which is essential in promoting healthy intestines. Dates contain selenium, manganese, copper, and magnesium, all of which are integral to healthy bone development and strength, particularly as people begin to age and their bones gradually weaken. Date Palms came to Yuma in the early 1900's when a nasty blight in the middle east threatened to kill off all date palms. The U.S. Dept of Agriculture at the time took several palms, eleven of which were successfully planted and grown in a little farming town at the base of the Colorado River just north of Mexico: Yuma. Hundreds of trees have grown from the offshoots of those original eleven and Yuma/Bard Valley now supplies the world with over 10 MILLION pounds of Medjool Dates per year, including the countries in the Middle East where the grandfather trees originated. As part of the annual Medjool Date celebration this past December, the Yuma Convention and Visitor's Bureau had its very first Date Night in the Groves. A group of people (myself included) met in the tiny downtown area, boarded a bus, and headed out to one of the larger date farms to enjoy a delicious dinner under the palm trees. A trio of strings was playing Music of the Night as the sun was dipping off into the western sky. At the bar, we had our choice between Wine or Date Beer. Naturally, I went with the beer. It was just the right combination of bitter and sweet and ended up being the perfect pairing to our dinner. Interested parties won't have to wait until next December for the annual Date Festival to enjoy a night in the groves. Yuma Convention and Visitors Bureau is planning to make Date Night a monthly event. They took the month of January off to do what we all do in January: recover from the holidays. The next Date Night is perfectly scheduled for Valentine's Day weekend. If you do decide to head out for a weekend in Yuma or if you're headed in either direction and want to take the time to stop and enjoy the fruits of Yuma's labor, I recommend staying at the Hilton Garden Inn. It's located right on the river and just a couple of blocks away from Yuma's historic downtown area, which has a couple of gastropubs, an art gallery, several shops, and all kinds of nice Snowbirds to chat up. To make a reservation for Date Night, call 800/293-0071. Today, Legoland California Resort will open a behind-the-scenes look at the real movie set of The LEGO Movie at its new exhibit: The Lego Movie Experience. but not as cool as seeing the set of the movie! Here's my little Master Builder! 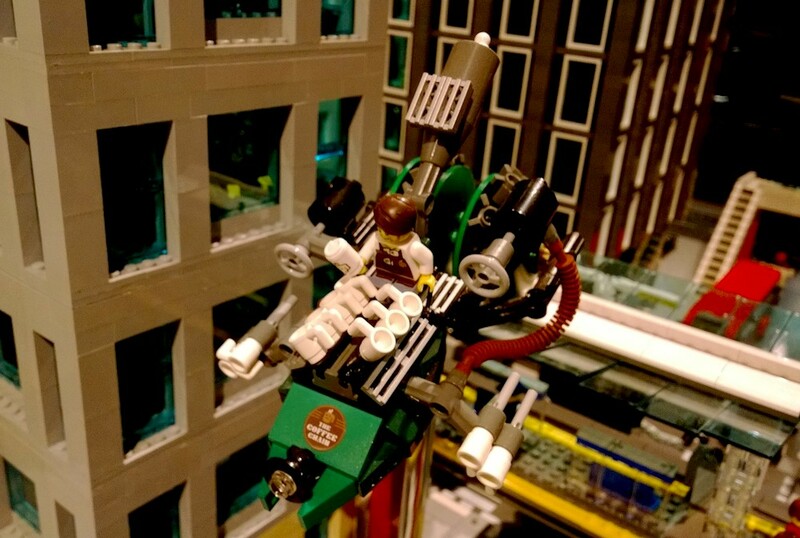 What does my little Master Builder spy? An ice cream truck... sort of. Personally, I prefer the coffee blasting vehicle. Imagine the road trips you could have in THIS baby!!! This was our favorite spot. It's also the place we had our age old argument of Kragling the Millennium Falcon. Here's my Master Builder at the dad's desk. Now he wants the same thing. Good luck, kid! 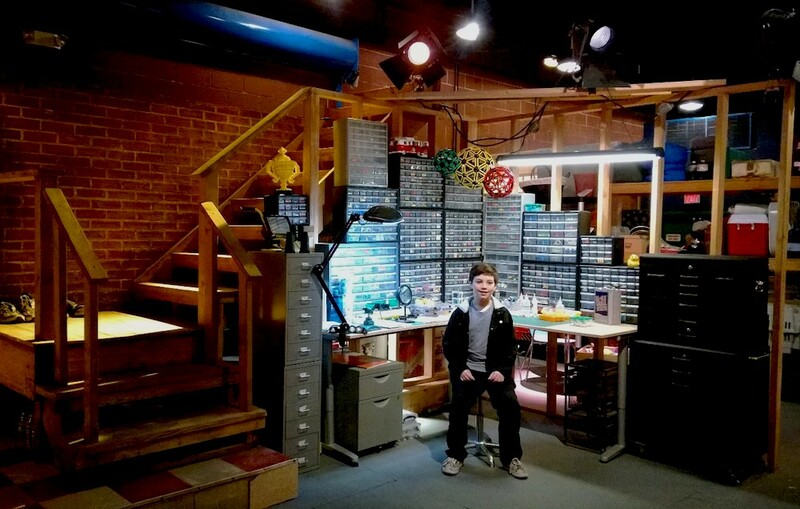 It took LEGO Master Builders 5 weeks to design models that make up the worlds that appear in Finn’s basement in the film. 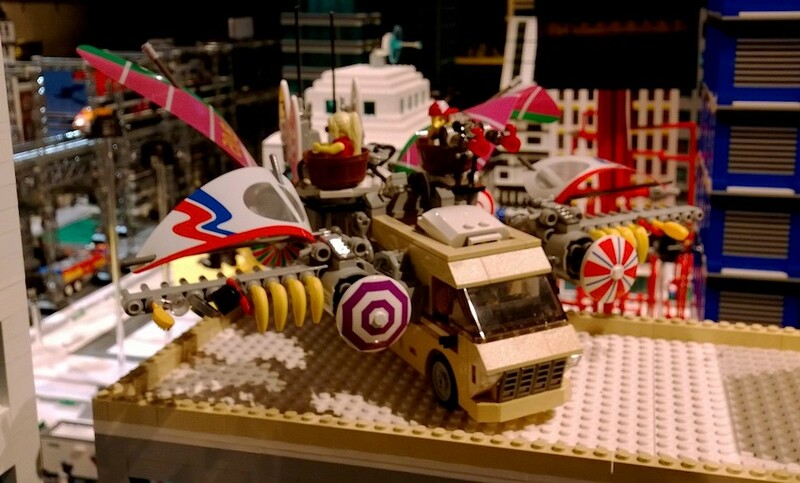 It took a team of 10 LEGO Master Builders 2,000 hours (full-time over 5 weeks) to build all of the models. The finished models contain approximately 1.5 million LEGO bricks and elements.